How to conduct a background check of a Polish business partner? Is it possible for a foreign company to check the information provided by the Polish company? Many foreign companies want to be active on the Polish market or find a supplier from Poland. Before starting the business relationship, it is always a good idea to take the necessary steps to perform a background check of a Polish business partner. The Polish Trade Register (Krajowy Rejestr Sądowy) is the best source of information about the Polish company. As in other countries, not all entrepreneurs are registered in the commercial register. It is possible to find here information about all companies except company constituted under civil law (spółka cywilna). The commercial register in Poland is accessible on-line. You do not have to pay for the HR statements, they are free of charge. 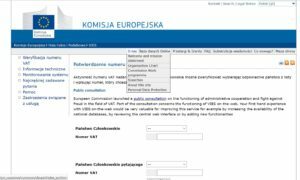 The Polish Commercial Register is available on the website ems.ms.gov.pl. The information is unfortunately only available in Polish. In Poland, the individual enterprises are not entered in the commercial register. All natural persons who run a business are registered in a Central Register and Information on Economic Activity (Centralna Ewidencja i Informacja o Działalności Gospodarczej – CEIDG). Here you can check the most important information about a Polish sole trader and company constituted under civil law. Access is possible at prod.ceidg.gov.pl. There you will find the most important information (address, tax number, REGON number). English version is available. In Poland, every entrepreneur and every company has a tax number (NIP – Numer Indentyfikacji Podatkowej). For VAT purposes the same tax number is used as for other taxes. As VAT ID is used NIP number with a prefix PL. Whether the Polish company is eligible for intra-Community supplies and acquisitions (i.e. has a valid VAT ID number) can be verified at http://ec.europa.eu/taxation_customs/vies/vieshome.do?locale=en. Tax number NIP can be checked on website of the Polish Ministry of Finance: https://ppuslugi.mf.gov.pl/_/. As far as taxes are concerned, we can ask for a clearance certificate from a future partner (zaświadczenie o niezaleganiu z podatkami). This would make it possible to check whether the Polish company has no tax debts. From June 2018, a register will be kept in Poland, with the taxpayers registered with arrears. To check your future or current business partner please contact our office. We’ll conduct the background check in your name. If we find out that the Polish company exists and has a valid VAT ID number, this does not automatically mean that the foreign company should sign a contract or place an order. It is first recommended to legally review the contract template used by a Polish counterparty. If you need further information on the verification of a business partner in Poland and the legal support, the law firm JLT is always at your disposal. Over 10 years of experience in the support of foreign clients guarantees high-quality and efficient legal and tax consulting in Poland. We will conduct a background check of Polish company in your name and check the financial position of Polish partner. In this way you can minimalize your risk of doing business in Poland.